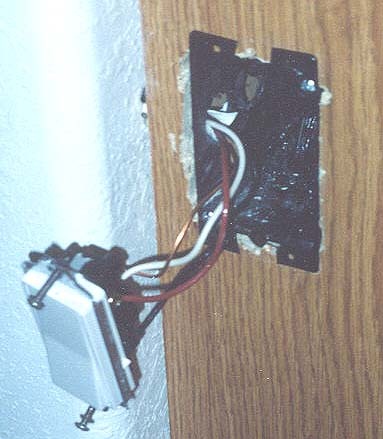 This remodel box is a plastic type, cut into a kitchen cabinet, fed with a #14-3 NM-B cable which enters directly to the left of the box, as seen between the cabinet and wall. Notice 2nd open ko behind ko which has cable in it. No clamp is used. Electrician (20 years +) is trying to use Section 370-17 (c) exception (1999 NEC) for code compliance. Any comments? The exception applies to boxes mounted in a wall or ceiling. This isn't either. It's a cabinet. I always thought this exception addressed plastic nail-on boxes which need to be stapled within 8 ". Just to clear things up, the exception to 370-17(c) still requires that NM cable enters the box through a "cable knockout". From what I can see in the photo, the cable is entering through a conduit knockout. Redsy's comment was correct..that the exception is more pertinent to the notion that you can staple the unclamped wire within 8", measured along the wire, and an exception to the usual 12" allowed in Article 336.
i don't think that is a knockout at all...just a hole drilled in the side. you can see where they failed on the first attemt. I don't recall ever seeing any of the plastic boxes that had a conduit KO or hole in the side of the box. Could this be a possible listing violation?